I went to Maine for the first time in 1997. I was on a East Coast tour, and just hit Niagara Falls, Southern Vermont and made my way up Portland to try my luck. I remember seeing the Old 97s at some little downtown bar. It was October and the place was cold, wet and green. And beautiful. A cool, coastal vibe. Lobster this, lobster that. I spent a couple nights just north of Portland, sleeping in my van off of some dark exit. I remember this: You could Portland lighting up the night south of me. But north, man, that sky was DARK. There was this sense of some wild, vast, dangerous frontier looming on the horizon. I didn’t venture into it. My visit this spring was incredible. Fast? Sure. But Sean and Avantaggio took great care of me, and I really dug the town. Thank you to everyone who came to the show! We made a poster for our big night in town, and that’s what we’re peddling right here, right now. Come on Maine, get it going! 01. Printed on French “Starch Rain” Speckleton poster stock. Feels good. 02. Four colors! Inspired by coastal Maine blues and interior forest greens. 03. 18” x 24”! 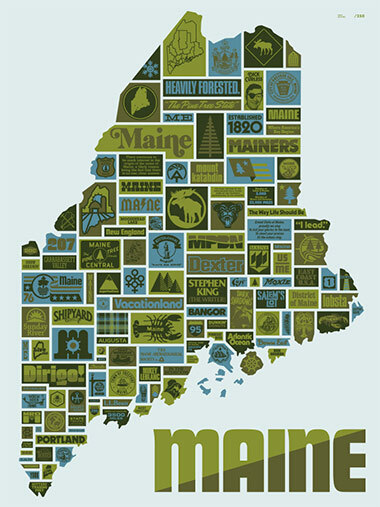 Big like the state of Maine! 04. Proudly printed by the ink champions of The Half And Half. Thanks, buddies. 05. Ahm tellin’ you, get in closah: Zoom in some, chowderhead! 06. Built to handle ALL Maine domiciles! From coastal shack to moose-infested cabin, from Portland halfway house to Presque Isle prison cell, from Bangor “writing room” for the guy who wrote “It” and” The Stand” to some stinky, little Freeport LL Bean breakroom wall. Wherever you lay your head, we’ve got you covered. This thing is good for ALL of Maine! 07. Dedicated to our buddy Mikey Leblanc, our favorite Mainer!